THIS IS FOR BLACKWOOD HIGH SCHOOL. Longest standing approved green and gold 32 panel championship ball with fine pimple surface for better grip and endurance. This 4-layered ball contains a new and improved bladder that retains air pressure for up to 6 weeks. 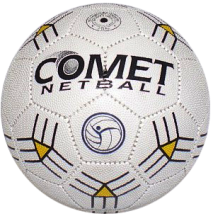 Comet Netball has a great range of balls for all court surfaces and for players from the beginner to the elite. With Comet Netball’s high quality air retention system, large number of panels and cross sectional layers you’ll be pressed to find a ball which will last longer and retain the desired air pressure as long anywhere in the world. Exclusive to 100% Netball's range of premium umpire clothing. 160gsm True Dry Mesh Knitted. 60% Cotton, 40% Cool Dry. Durable polymesh knit in cooldry polyester with cotton back. Look sharp on the court and take control with the 100% Netball range of umpire clothing. Black and gold 32 panel indoor/outdoor multi-surface netball with raised pimple surface has increased durability for asphalt surfaces. This ball too has 4 layers and contains the new and improved bladder for longer lasting air pressure. 4-6 weeks. Size 5. New Club Training balls in fantastic bright colours. Please note these are size 5.